A Pelita Air RJ85 on the ground. 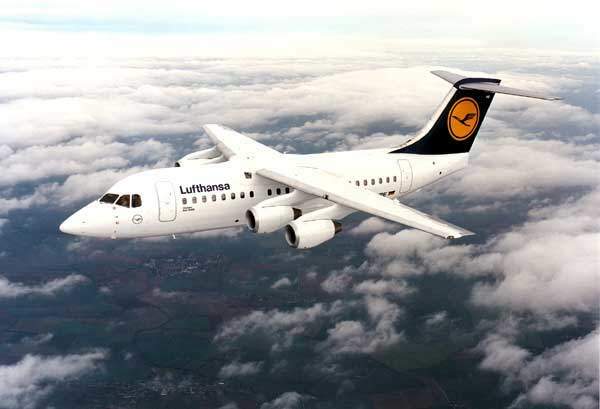 A Lufthansa CityLine Avro RJ. The Avro RJ regional jet family includes variants with 70, 85 or 100 seats. 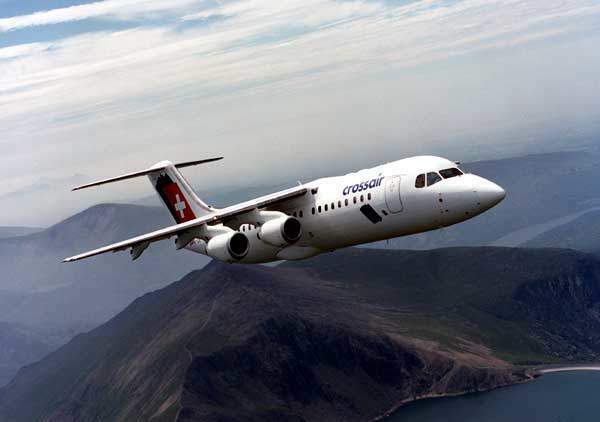 The Avro RJ is powered by four Honeywell LF 507 turbofan engines, fitted with Full Authority Digital Engine Control (FADEC). 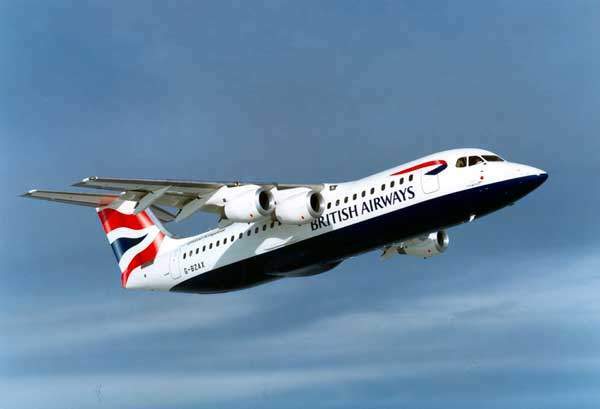 The RJ100 launch customer was the British Airways Express. Avro RJX.in the livery of British Airways CityFlyer. Uzbekistan Airlines RJ85 on the ground. 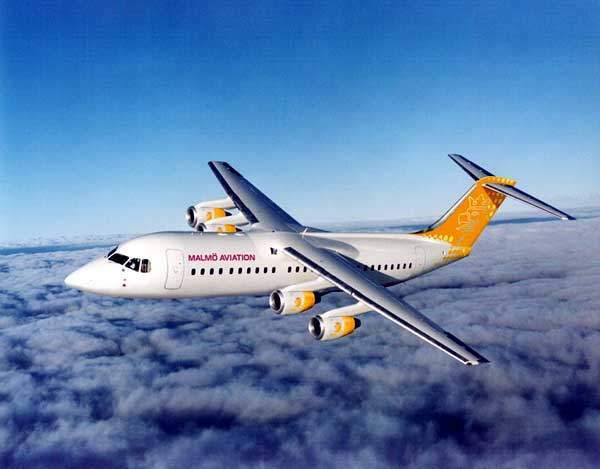 The Avro RJ transport jet and the Avro Business Jet variant were developed from the BAE 146 short to medium-range regional airliner. 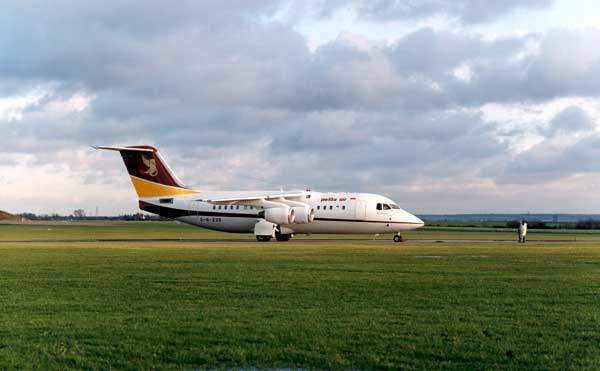 The Avro RJ family of aircraft was built at the BAE Systems Regional Aircraft Centre at the historic Avro Airfield at Woodford in England. 170 aircraft were delivered. The first production aircraft was delivered in 1993 and production ceased in 2002. The last four aircraft built, two RJ85s and two RJ100s, have been leased from BAE Regional Aircraft by Blue 1 (formerly Air Botnia) of Finland. 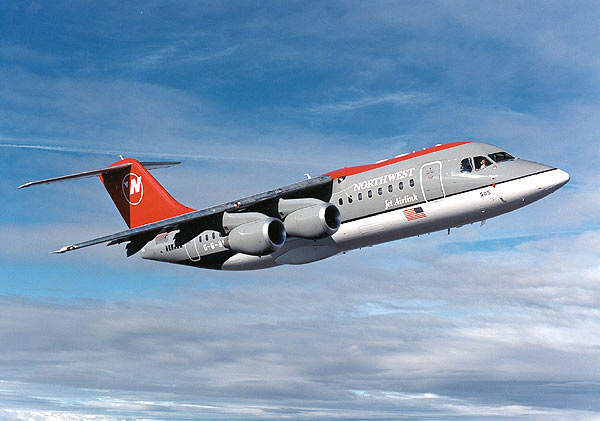 The last Avro RJ was delivered in November 2003. As of October 2008, 164 aircraft remain in service, largely now used in the VIP and corporate transport role. BAE Systems Regional Aircraft is offering a refit of the jet with new interior designed by Design Q of the UK. The Avro RJ regional jet family extends from 70 to over 100 seats. The three variants of regional jet are RJ70, RJ85 and RJ100, which have different cabin lengths, but complete engineering and operational commonality. One Avro RJ85 is in a service with the Bahrain Defence Force, where it is used for transport and other duties. The Spaceliner cabin layout, designed by C&D Interiors, gives very high flexibility with six-abreast economy class, five or four-abreast business class or mixed-class seating configuration. The variable geometry seats can be expanded or compressed quickly between flights using either a hand tool or an integrated electric motor. The four doors and galleys located at each end of the cabin allow very fast passenger enplaning and deplaning and cabin servicing between flights. The full height doors and industry standard sill heights mean that no special airbridge docking procedures are necessary. The minimum turnaround time for unloading 70 passengers and loading 70 passengers for the next flight is typically 13 minutes. The aircraft is powered by four Honeywell LF 507 turbofan engines each rated at 31.1kN. 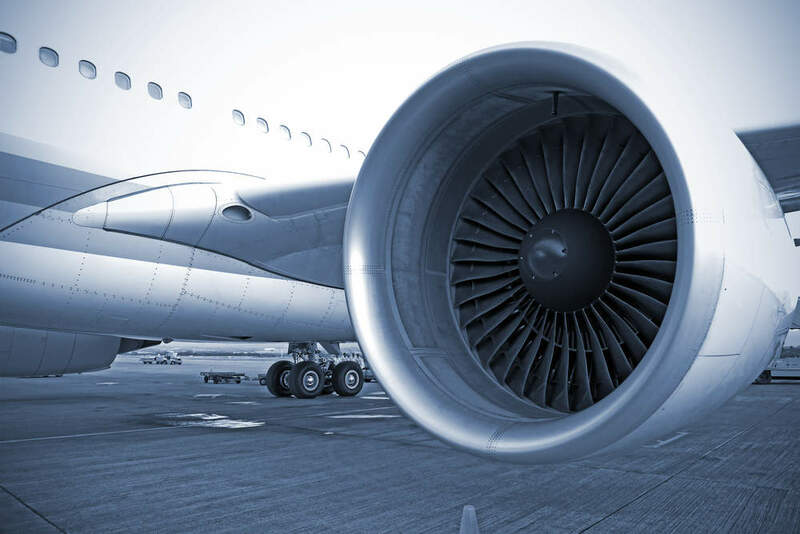 The engine is fitted with full authority digital engine control, FADEC, providing cooler temperature starts and power management with monitoring of the engine speed and temperature to optimise the fuel consumption. 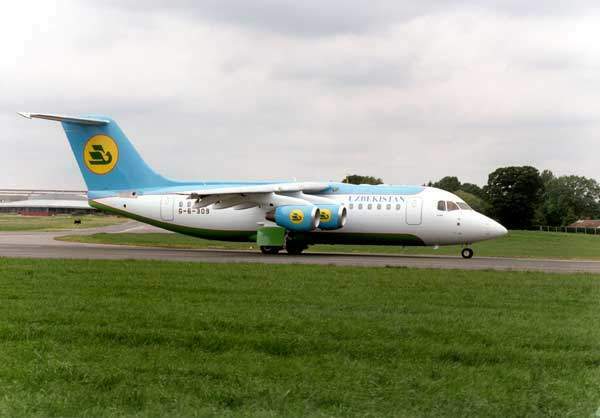 The typical routes for regional jets are between 450km and 900km but the low fuel consumption and increased range of the Avro RJ result in the aircraft being in regular operation on routes over 3,000km. The aircraft can use demanding airfields, from international airports to short runways, city airports with obstructed airfield approaches, high terrain and unpaved or weak runways. The aircraft is fitted with low-pressure tyres and protection systems for safe operation from unpaved runways, including main undercarriage bay shielding and stone guards, an anti-collision beacon cover, antennae protection, a nose leg stoneguard and abrasion resistant paint on the fuselage. A key feature of the aircraft is its all weather landing capability, with ICAO Category IIIa landing certification as standard and Category IIIb as an available option. The aircraft is fitted with all digital ARINC 700 avionics and a Rockwell Collins CNLS 910 flight management system. The RDR4A weather radar and digital flight guidance system are supplied by Honeywell. The cockpit accommodates the pilot and co-pilot. The instrumentation includes an electronic flight information system supplied by Honeywell with a 5in×6in primary flight display and a navigation display. The status of each engine is displayed on a two electronic information system supplied by Smiths. The pilots have dual VHF radios with selective calling, a PA system and a cockpit voice recorder. The flight deck windscreen is equipped with electric anti-icing and demisting system and a rain-repellent coating. Tailored courses are offered to pilots and engineers. A typical pilot conversion course includes ten days of ground school and cockpit procedure training, followed by 20 hours of full flight simulator at the British Aerospace facilities in the UK or in Washington DC. The fail-safe fuselage has a chemically etched skin and the all-metal fail-safe wings have machined skins. The wing and the T-tail plane leading edges are equipped with hot air de-icing systems. The Dowty tricycle-type landing gear is fitted with twin Dunlop wheels. The nose wheels retract forward and the two main landing gear units retract into fairings on the side of the fuselage. The main wheels are fitted with Dunlop hydraulically operated multiple disc carbon brakes.